The Ronj Coffeehouse, located at 30 Frye Street, was opened in 1997. Ross House in which the Ronj stands was originally built around 1871 by Bates Professor of Chemistry and Geology Richard C. Stanley. Ross House was soon occupied by Bates’ second President George Colby Chase along with his wife soon following his arrival at Bates to teach Rhetoric and English Literature. In 1939, the College purchased the house from Professor Stanley’s grandsons for use as faculty housing. Norman Ross, class of 1922 and long-time College Treasurer, soon moved in along with his wife where they resided for 72 years. Rightly named after her longest occupant, the house was left open as Ross and his wife moved to Russell Park Rehabilitation and Living Center in 1997. 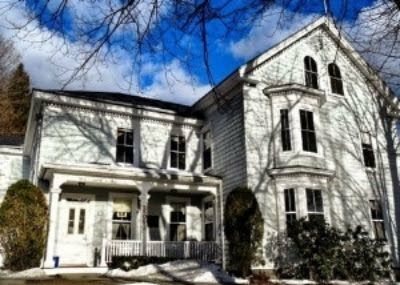 In keeping with the Rosses’ manner of opening their home to visitors and students, the house was overtaken up by a group of students looking to provide additional social options to students, faculty, staff, alumni, and guests in a non-alcoholic way. The outdoor barn which had become the Ross House garage was connected on both sides to the house to become the Thunderdome Performance Room on the first floor, and the Pool Room on the second floor. The Red Room on the first floor, and Thesis Room on the second floor were treated with ventilation systems to become functioning smoke rooms (now disconnected). The Rosses’ beloved kitchen became behind-the-counter space, and the living room an area for socializing and playing games. The attic, closed off due to fire-hazard regulations, remains with original wall paper and decorations, though only the ghosts of Ross House now hang out there.